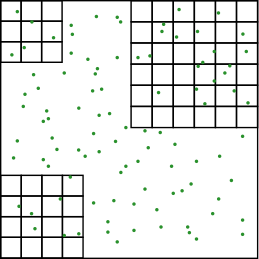 The scattergram below shows the number of granules per square foot to help you apply labeled rates. Read and follow label directions prior to application. SSI Maxim granular herbicides (with the exception of SpraKil S-5) should be applied at a rate of 3/4 lb. per 100 square feet with calibrated ground equipment, or spread manually for spot treatments. Refer to labels for actual labeled application rates. The active ingredients in SSI Maxim granular herbicides are carried on limestone granules, which flow easily through most application equipment, thereby reducing dust and drift. NOTE: “SCATTERGRAM” ILLUSTRATES HOW MUCH GRANULAR PRODUCT SHOULD BE SPREAD TO EQUAL A SPECIFIC RATE. 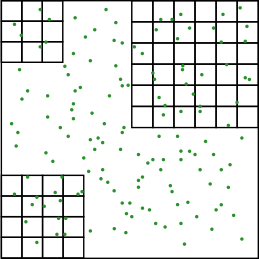 EACH BLOCK IS ONE SQUARE FOOT (SMALL SQUARES ARE INCHES), AND EACH DOT REPRESENTS ONE GRANULE OF HERBICIDE.